The first Broken Sword game came out in 1996 and it was a hit. Interesting storyline, witty main character George Stobbart, and beautiful locations won the hearts of many. It was done in a detailed, cartoony style, with a point-and-click interface. The second game used a similar style, with improved graphics, and it was a success as well. However, series took a downfall with the third installment - it was done in full 3D, and was keyboard-controlled. It probably wouldn't have been as hated if it wasn't for annoying (and sometimes very tough) action scenes, where player had to press certain keys as they flashed on screen or had to run away from danger really fast. No wonder everyone was skeptic when they announced yet another Broken Sword. Action sequences? 3D or back to basics? Is it good? Is it bad? The answer to all of this is: It is pure fanservice. You didn't expect that, did you? It's very simple, really. The game is in full 3D again, with more or less fixed camera angles. It's back to old-school point-and-click control, although you can use arrow keys to move around. If you click somewhere, George will walk or run there (run/walk can be toggled via mouse wheel). You can also drag the mouse and George will follow it. Fun, huh? I really liked the new system. There was one small problem, though. If you moved around by dragging your mouse, George would stop walking if you entered another room. It does get on your nerves after some time, so I recommend using arrow keys instead. When there's an item to pick up or object to use, the pointer changes (eye for looking at item, gear wheels for using it, etc.). The inventory is located at the top of the screen. All you have to do is drag your mouse up to display it. You can use, explore, and combine items inside your inventory. If you've been wondering, nope, there are no action sequences. Rejoice! But to make up for the lack of them, there's a bunch of sneaking sequences. 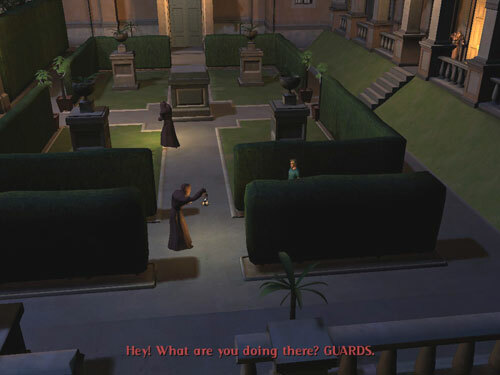 You'll be having fun sneaking past guards, Vatican monks and many more. If you make a mistake (i.e. the aforementioned people spot you), you'll be taken to the starting point and have to do it all over again. Luckily, these are very short, so you shouldn't have much trouble. However, you cannot save in the middle of a sneaking sequence. This game left me a very sad beholder. When someone mentions Broken Sword, I immediately think of colorful graphics and detailed surroundings, with silly little animations that make game come to life. 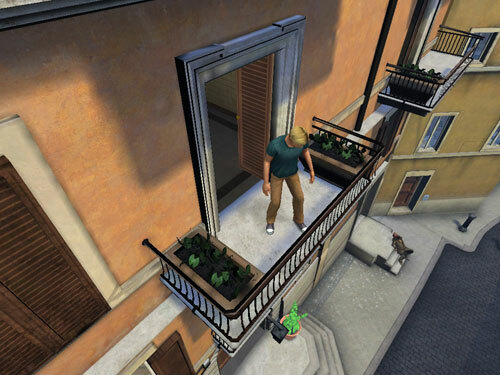 Broken Sword 4 is devoid of all of that. Levels look big and empty, with no details whatsoever. I have a friend, a future architect, whose idea of an ideal room is something very huge and very blank, with no more than a chair in the middle. She would've loved the game. The most colorful location you will visit are the sewers, I kid you not. However, characters are more detailed and nicely animated. Some of them are detailed to the point you'd think all you have to do is reach out and actually touch them. 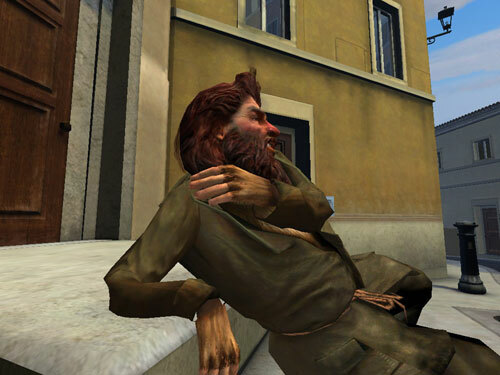 A certain homeless man looks particularly real. While overall animation looks nice, facial expressions are far, far away from that. George likes grinning, and when he does, you will be presented with the biggest, most idiotic grin in the history of gaming. On the upside, at least it will make you laugh. Yes, the system requirements for Angel of Death are pretty low and you can probably thank the graphics (or a lack of) for that. But that is not a valid excuse. Broken Sword 3 was way more detailed (and prettier looking in general) than this installment. But let's not be too nitpicky - good thing is that you can find items with ease. Short cut-scenes are all over the place, which I found really nice. There is only one fully-rendered scene, and it's the opening. Which doesn't make any sense whatsoever. But it is filled with magic and sparkles, so it can be forgiven. You'll be getting lots of information from other characters, which makes the conversations essential. Most of the time, topics will disappear as you discuss them. There are rare cases in which they stay where they are, although there's nothing more to talk about. In these cases, conversation will just be repeated. Here's some bad news for chitchat haters: you can't click through conversations to skip them. Sorry! Ah, the puzzles. There's a nice share of inventory-based ones, but also a few of those where you have to push an object around. Nope, no box-moving puzzles this time, although there is a room full of boxes early in the game. There are also logic puzzles, where you have to match some symbols or click certain things in a certain order. There are two huge sets of such puzzles that are pretty entertaining. You'll have to play and see, though, because I don't want to give anything away! If you get stuck in the game, you can always follow a link to the game's official page with hints. A warning, though - they're not exactly spoiler-free. 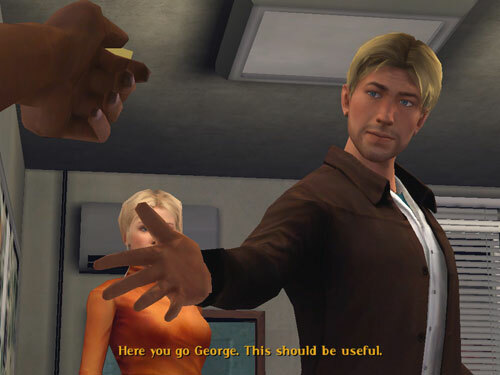 In your inventory, you will find George's PDA among everything else. You can use it to call people, take notes and - hack servers. This is where a really entertaining, albeit tough, mini-game comes along. You will have to send signal from spot A (you) to spot B (server you need to hack) by using various routers, mirrors and pipes while making sure signal doesn't end up hitting devices that can discover you. All of this may sound easy, but trust me - it's not. Some of them may make you spend days hacking. A blonde, green-eyed girl named Anna Maria comes to you seeking for help. She owns an old manuscript (what else?) Made by Templars and needs you to decode it. In the middle of the conversation, bad guys burst in and the two of you run. Long story short, George develops some kind of a crush on Anna Maria and goes desperately looking for her when she disappears one day. And that's all the story has to offer, really. There are some small twists and turns and the story unfolds nicely, but it's still a bit too weak to be taken seriously. Silly grins and empty spaces aside, Broken Sword 4: The Angel of Death is a true candy for fans. 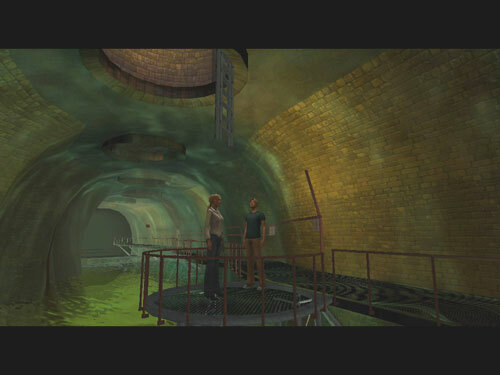 For one, you will often find yourself in very familiar locations and positions, and characters also often reference the previous games (for example, one character says "Smoke and mirrors, smoke and mirrors..." alluding to the second game titled The Smoking Mirror). Also, one must not forget the ever-charming Stobbart humor. To be honest, I was scared this game wouldn't be as funny as previous installments - but it was funny. Hilarious, even. 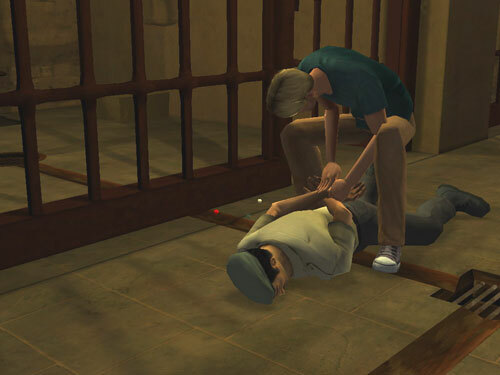 There is this little bit in the game where you find yourself tied to a chair, Broken Sword 2 style. It makes very little sense, but I couldn't stop laughing. The funny part involves a certain box, but I am not going to spoil it for you. The 'fan' part of fanservice includes a few returning characters that will certainly make you smile. Nico, George's former girlfriend, is back, too. As usual, you will be able to play as her for some time. I find it funny how she changes with each game - her clothes, style, even her face change. In this one, she reminds me a little of the fellow adventure game heroine, Victoria MacPherson. In the 'Extra' menu you will find concept art and 3D renders which is a very cool addition. Broken Sword 4 is a game worth playing if you've played previous games (you'll miss out on a lot of fun if you haven't). It's not a requirement, though - it is fun enough to hold your attention for a while and it can be beaten pretty fast if you know what you're doing. It's not terribly good nor terribly bad - it's one of those games that will make you laugh a lot, that you will finish and probably forget. But definitely worth playing, if only to hang out with George and Nico one more time. * Indicates that device must be compatible with DirectX 9.0c.